Ten people dress up in bunny suits, many of them for the first time in their lives. Under the hoods, hair nets keep their hair in place. Goggles are provided to cover their eyes, and their gloves are secured into their sleeves. Any facial hair is also netted. With all hair, dust, and lint securely tucked out of the way, the Students are all set to enter the Stanford Nanofabrication Facility. This specific group was part of a class from California State University, East Bay, co-taught by Ryan Smith, Assistant Professor of Physics at CSU-EB, and Erik Helgren, Associate Professor and Chair of Physics at CSU-EB. The class visited as part of a partnership between the two schools, designed to introduce Cal State Students to nanoscale Science and Engineering. Many of these students have never seen a clean room. Many have an image from commercials or movies but they’ve never seen one firsthand. Having that up-close experience has been very formative for some of the students. It’s helped them get a deeper picture of what science is about and how that relates to industry and technology. The National Science Foundation awarded $81 million to 16 nanotechnology facilities in 2015 to support cost-effective access to outside Engineers and Scientists from research institutions, companies and schools. At Stanford University, this has aided in funding the [email protected] initiative, which comprises of the Nanofabrication facility, the Stanford Nano Shared Facilities (SNSF), the Environmental Measurements Facility and the Mineral Analysis Facility. The staff at these nano facilities have been providing tours of the facilities and hands-on demonstrations of instruments over the years. Using this grant, staff members are improving their outreach efforts to include summer workshops for local Middle School Teachers and a research partnership with CSU-EB, a partnership that is expected to result in a journal paper in the coming months. In order to manipulate matter at the atomic scale, one needs to work in a space that regulates tiny disruptions, which a person would not even notice. The cleanroom suits worn by the Students prevent hair and skin from being shed into the nanofabrication facility cleanroom. Other areas of the facilities are sheltered 18 feet underground to provide an environment free from undesirable vibrations, electromagnetic interference, acoustics and light for working with extremely sensitive instruments, such as advanced electron microscopes. For Students, direct experiences, like touring these facilities and getting practical practice with some of the instrumentation, can make known what it means – and what it entails – to conduct research at such an incredibly small scale. When you have a transmission electron microscope and you can point to the screen and tell visiting students ‘that’s an atom,’ the reaction is, 'Whoa!' Because they are familiar with atoms, it makes the scale so much more real. The tours include descriptions of relevant work going on at Stanford, educational information about Nanoscience and overviews of the broad array of equipment available to Researchers. For a few Students, nanoscience conjures Fantastic Voyage technology that enters into the human body to sort medical problems. But tours like this can exhibit that the field includes a wide range of research, including sensor technologies, energy conversion and information processing. Besides the usual facility tours, the CSU-EB visitors watched a staff member perform a hydrofluoric acid dip to remove the oxide layer, an important step in the manufacture of solar cells. Directly after, Students performed four-point probe and ellipsometry measurements, processes central to the fabrication of solar cells as well as computing technology. 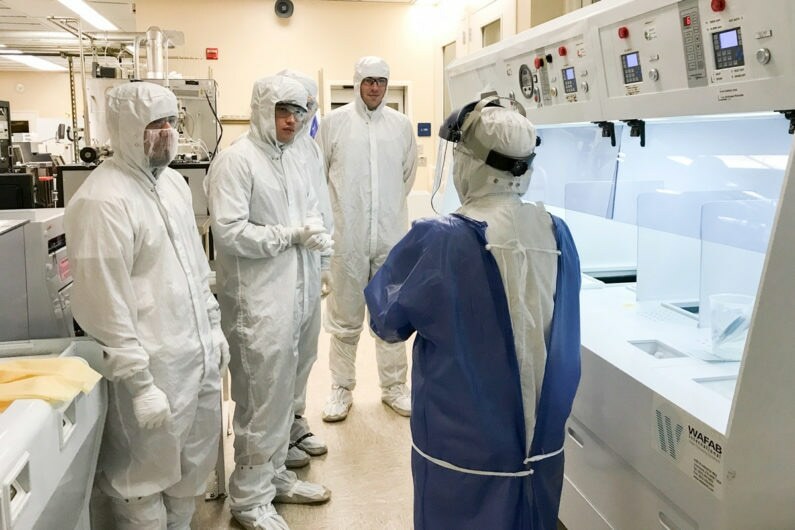 Since hydrofluoric acid is not used at CSU-EB, visiting Stanford gave the Students a chance to learn about how the wafer processing process works in an advanced laboratory. By experiencing this process, students can actually begin to see the connection between their research projects and the things that they see that are happening at Stanford, and that helps complete the picture for them about what nanoscience is about. The nano facilities staff considers that accessibility goes further than physical access – whether Students enter into the field can also be impacted by how early in their education they study about it. Among Undergraduates, outreach can be particularly meaningful for transfer Students because it can reveal to them that Nanoscience is a field they should contemplate studying, even if their first institution does not have classes on the subject. “Usually people transfer from community college after their second year but by the time they do that, even if they come to Stanford, it’s often too late to get them thinking about this kind of research,” said Angela Hwang, the Academic Program Manager for the NSF-funded program. The research paper that Smith and the Stanford staff plan to publish will describe the details of how this interactive tour can stimulate student education, in this case around solar cell technology. Overall, Smith said, the visits inspire his Students and have encouraged many to choose careers in Nanotechnology and Nanoscience.